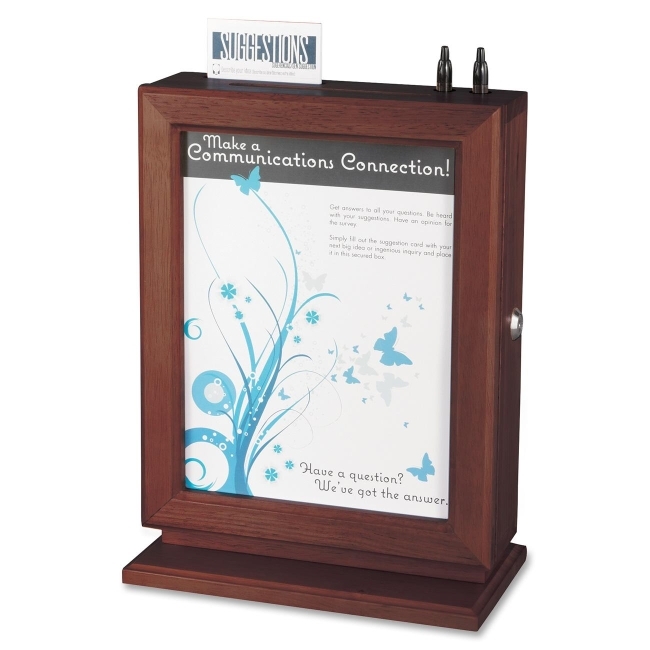 Elegant, wood suggestion box inspires more participation with a customizable panel for topics or thought-provoking questions. Perfect for collecting suggestions in any office setting. Letter-size, plexiglas panel clearly displays any communication and lets you easily customize or change your message. The top has a space for suggestion cards and two writing utensils. Use the included hardware to mount the suggestion box to the wall in your breakroom, lounges and other common areas so everyone can have a voice. Entry slot size measures 5-1/4" wide x 1/2" deep. Box is made of solid wood with a mahogany finish. Suggestion box also includes two keys that are keyed alike.